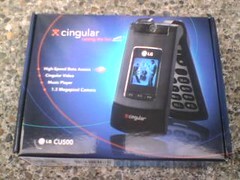 Last Saturday I picked up a new LG CU500 from the Issaquah Cingular store. I stopped by the Everett store on Friday, but they hadn't received any yet. I called the Issaquah store on Saturday morning and was told they had loads of them. $250 and a sim transfer later, I had my new phone. Apparently I was the first person to buy one from that store. I also picked up a 1GB microSD from Fry's later in the day. The camera takes pretty good pictures at least compared to the RAZR. The swivel camera thing is funky, the picture is upside-down when facing you. I took a picture of the box with phone and wanted to blog about it. 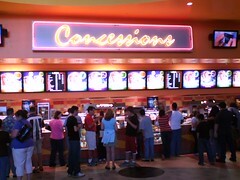 Took me a while to figure out how to post to via flickr. There is no email client. Turns that you can use the SMS/MMS email gateway. You just need to change your SMS preferences to include a subject. One thing that I learned, the hard way, none of the web-based mobile mail services (Gmail, Yahoo!, MSN, Media.Net, etc.) provide an option to attach file(s) to emails. Also, you can't login to Flickr Mobile if you have merged your flickr and yahoo accounts. Arghhh! 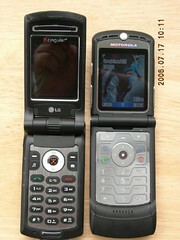 It's actually smaller than the RAZR, but a little thicker. My wife actually like how it feels better than her RAZR. There is no direct USB port, you have to buy an adapter for the proprietary port. 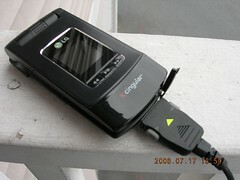 That's one thing I really liked about the RAZR. You have to have tiny fingers (or long nails) to put the microSD card in. It fits right under the latch for the battery in the back. 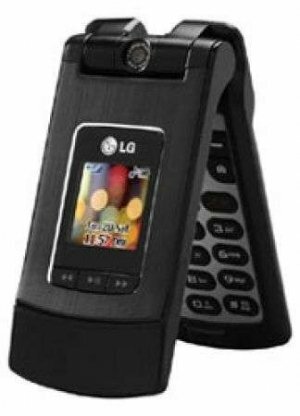 I've never used a LG phone before, but the interface is not much different than the RAZR, probably a little easier to use. There is no voice dialing, which I will sorely miss, especially when using my BT headset. Java (J2ME) programs (such as Opera Mini) need to be authorized each time they access the net. What a pain. I noticed that the bundled Java apps (like mobitv) first ask about permanent access. I'll have to see if singing a jar with a personal certificate helps. HSDPA is fast, really fast. Watching TV to Go is actually fun. IM support is terrific. The phone comes with Y! Messenger, AIM, MSN and ICQ clients. The built-in Music Player is adequate, except that you can't add .wav files to playlists. It plays them, only when selected directly. You can't use a .wav file as your ringtone either. There is a flight mode. Neat! When the phone rings the volume exponentially increases. There doesn't seem to be a way to change that behavior either. You can't control the phone volume when it is closed. The up and down button are inactive unless you're using the Music Player, which means that you have to flip open the phone to turn the ringer off at the movies, etc. The screen is much sharper than the RAZR, you can see the difference when loading wallpapers, etc. I had no problems pairing with my BT headset and my computer to transfer files. mobiradio (7-days trial) stops playing when you close the lid. You can't multitask when it is running either. I haven't figured out a way to load Java apps via Bluetooth yet. OTA works though. MusicID is integrated. It worked too. No problems identifying Midnight Mover. 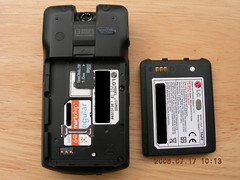 I've been looking for a small phone with 3G support for a while now. The LG CU500 delivers just that. This is a good move for Cingular. 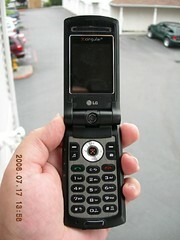 It may not be as attractive as the RAZR, although most people I showed it to mistook it for a RAZR. But it surely packs a punch. We'll see how I feel about it after a few months, but so far I'm a very happy camper. This story was published on July 17, 2006 and last modified on March 11, 2018.